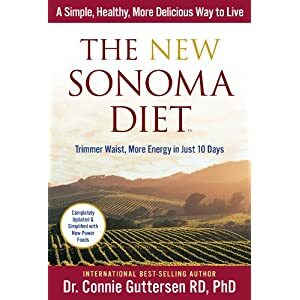 I recently read The New Sonoma Diet: Trimmer Waist, More Energy in Just 10 Days, by Dr. Connie Guttersen RD, PhD, published in 2010. It’s not designed specifically for people with diabetes or prediabetes. Per Amazon.com’s rating system, I give it four stars (I like it). The author makes a few claims that are either wrong or poorly supported by the scientific literature. Examples include: 1) beans are linked to longer life and reduced heart disease risk, 2) grapes are almost as good as wine for heart protection, 3) the health benefits of spinach “border on the miraculous,” and spinach helps prevent inflammatory conditions such as arthritis and asthma, 4) whole grains prevent stroke, gastrointestinal cancer, and diabetes, 5) adding salt and butter for flavor is unhealthy, 6) medicinal qualities of herbs and spices are well documented, 7) saturated fats “are found exclusively in highly processed food products,” 8) you’ll break a lifetime craving for sugary sweets in Wave 1, 9) 64 ounces of water a day is ideal, 10) exercise significanlty helps most people with weight loss, 11) low-carb eating cannot be maintained because it’s unhealthy and unsatisfying, and 11) saturated fats raise the risk of heart disease. Overall, this is one of the healthiest weight-loss programs available. The average non-diabetic person won’t go wrong with Sonoma. In fact, Sonoma-style eating may be the healthiest of all for the normal-weight general public, with the exception of its avoiding saturated and total fat. For folks with diabetes or prediabetes, I prefer Dr. Bernstein’s Diabetes Solution or, of course, Conquer Diabetes and Prediabetes: The Low-Carb Mediterranean Diet.